Three years after Tim Holt met Jamie Houghtelin at the San Diego Zoo, he placed a circle of roses on a patch of grass in the place they met, bent down on one knee, and proposed. She accepted and he placed an engagement ring on her finger. They married on Nov. 7, 2010, and recently celebrated their fourth anniversary. 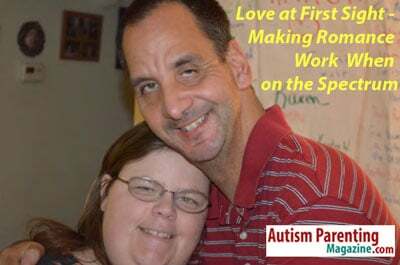 Jamie is autistic and Tim is developmentally disabled. Lifeworks is a company designed to support disabled adults who want to live in a home of their own and need a considerable amount of support to maintain their lifestyle. Supported Living Services (SLS) are for people who require more than 79 hours of support per month, Gallagher said. Jamie receives 200 hours a month in services and Tim about 50. Tim has been receiving services for many years, so he is still a client although he now needs fewer hours. Gallagher said Jamie, now 30, and Tim, 43, dated for about a year, while Tim was working near San Diego and Jamie lived about 30 miles north in San Marcos. Then Tim decided he was tired of being so far from Jamie. He was making good money as a clerk at Albertson’s, but he gave notice at the grocery store so he could move closer to Jamie and the “bright eyes” he said made him fall in love. Eventually they moved in together. Jamie had been living with a helpful, paid roommate in the apartment the couple now occupies. Both Jamie and Tim have jobs and work five days a week. Tim works at Camp Pendleton, the Marine recruit training base north of San Diego, in one of the kitchens as a dishwasher. He works 32 hours a week and makes enough money so he no longer needs Social Security Insurance. He also earns his own medical benefits. Jamie works for United Cerebal Palsy doing clerical tasks. She works about 30 hours, five days a week. They live in a one-bedroom apartment north of San Diego with their grey and white shorthair cat named Bunkle. Jamie and Tim now have an even bigger goal: They want to buy a house and have set aside some savings. A chart on the living room wall monitors their progress. Tim and Jamie aren’t afraid of saying “I love you,” on a regular basis. And they also aren’t afraid to ask one another to calm down, or listen. Jamie readily admits that sometimes she gets distracted or anxious. Tim said he takes a walk when they have arguments. “Tim’s always good to me. He’s cool,” Jamie said. As a support for Jamie, Anita helps her go to the bank, grocery shop, and cook. Anita also helps her budget her grocery money so she’ll have enough money for activities at the end of the week. Jamie doesn’t want Anita to make her decisions, Anita said, but Jamie has learned to accept help and accept Anita, so Jamie can make good decisions. Jamie and Tim have an active social life. They recently attended Disney on Ice, had separate sleepovers with friends, and visited the San Diego Chargers football camp where they met quarterback Phillip Rivers. They both participate in Special Olympics and are looking forward to doing the San Diego Race for Autism in March. Bascom said marriage among autistic people is becoming more prevalent. Gallagher, who has known Jamie and Tim for about 10 years through providing LifeWork services for them, says the couple has improved immensely since getting married. Jamie was receiving 24/7 care totaling 730 hours per month, but now receives one-quarter of that. She had been living on her own for four years, with roommates, before she met Tim. Tim used to get 24-hour care, but now needs only eight hours a week. I love this article. It is inspiring and gives me hope for my son when he gets older. Thank you for sharing Tim’s and Jamie’s story.